Introducing the new iQ-400 Semi Auto Strapping Machine, StraPack’s new semi-automatic strapping machine with dual tension mode. This allows for a wide variety of applications with just a flick of a switch. The iQ-400 Semi Auto Strapping Machine is a durable and heavy-duty strapping machine designed to withstand various harsh environments. 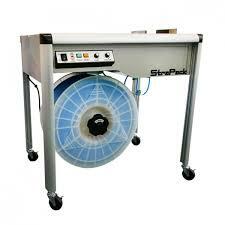 The iQ-400 Semi Auto Strapping Machine is yet amazingly quiet to operate and well suited for office use also. The iQ-400 Semi Auto Strapping Machine has less moving parts, which makes it easy to maintain and keeps the operation cost low. All electric parts are arranged in one side of the machine, enclosed in the cabinet, for easy maintenance and protection of crucial parts. The iQ-400 Semi Auto Strapping Machine runs strap from 5 millimeters to 15.5 millimeters (5/8 inches) without additional parts. The torque tension mode is suitable for stronger tension or to strap compressible packages, while the stroke tension mode is best for soft tension or quick operation. Tool-free access to frequently accessed areas for easy maintenance. Hinged tables are easy to remove for daily maintenance.